We arrive at the civilised time of 2pm at Graze Grill in City Walk for their ‘Lazy Grazing Feast’, a casual take on a Saturday brunch. A few tables have arrived ahead of us, although many arrive after – the premise of this brunch allows guests to arrive whenever they want between 1pm and 6pm, and enjoy a three hour package at leisure. The setting is simple and airy, with floor to ceiling windows that open up and allow cushy leather sofas look out onto the City Walk streets, while lively music pumps out, albeit a little too loud. 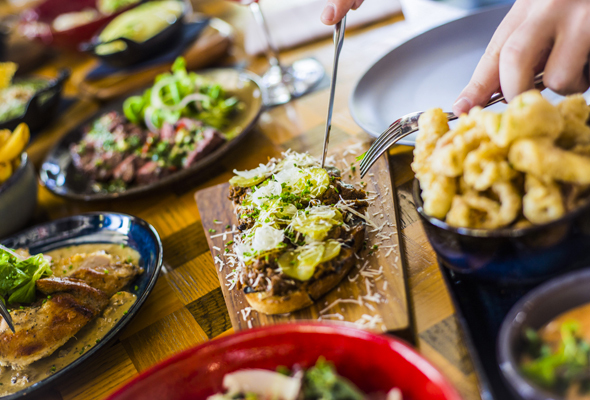 The Lazy Grazing Feast is a sharing menu that’s served to the table, and offerings are changed every few weeks by the restaurant executive chef, perfect for regulars. While there’s a big focus on meat, there’s a salad and calamari among the four dishes to start. Chunks of wood fired beetroot are served inside a bowl of lamb lettuce, roasted quinoa and chick pea with a light labneh lining the bowl, which makes for a light, flavourful dish when mixed together. Calamari is lightly battered, fried and complimented by a rich chipotle mayo, while the beef tartare is a standout starter. Finely chopped Australian beef is mixed with red onion, capers and chives with slithers of parmesan on top and served with grilled toast. It’s so good, we order seconds (something guests are invited to do with every dish on the menu). Mains arrive shortly after, and we keep a mix of our favourite starters on the table as the mains pile up on the table. It’s a simple offering of well-cooked chicken, beef and salmon dishes with a portion of each served between two. Alongside the meats, portions of creamy spinach, buttery mash potato, stringy mac and cheese loaded with truffle and crunchy sweet potato fries. It’s a generous serving that’s more than enough for two, and when we don’t finish it all, it’s a lovely touch that the staff offer to package up the leftovers for us to take away. Dessert is delicious. 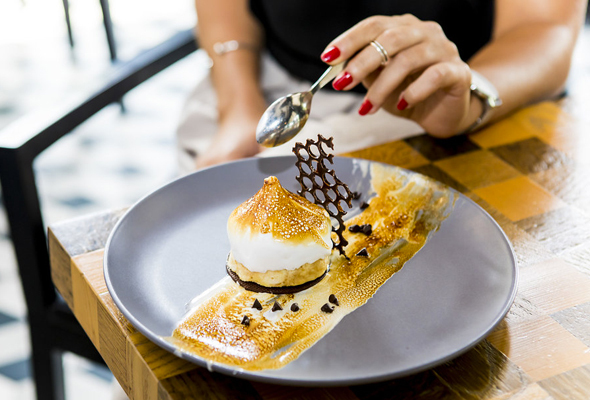 There’s two options; a deconstructed strawberry cheesecake with a crumble lining the outside bowl centring on a heap of sweet vanilla cream, and a large S’mores of ice cream covered in caramelized marshmallow with chocolate. If we weren’t already so full, we’d be ordering seconds of both. The three packages start from a reasonable Dhs199 with soft drinks, and for the volume of food, it’s great value for money.